How I found it: My mom read this for her book club and recommended it to me because of the Nova Scotia setting. What's it about? : The book follows the life of Dora Rare, a misfit a small rural Nova Scotia town at the dawn of WWI. Dora is apprenticed to the local midwife, despite the fact that midwifery has fallen out of favour with the men of the community who believe they should use the modern doctors available in the nearest city. Dora perseveres and manages to stand up for women's rights in a time when it was not common to do so. 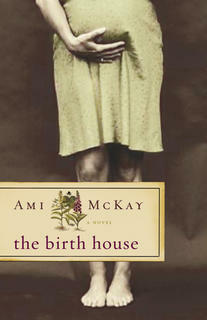 The book follows her from her adolescence to her middle age, and involves her friends, marriage, and children. Did I like it? : I liked this book, perhaps even more so since I have actually been to Scot's Bay, where the book is set (although I was there really briefly - that is where the hike to Cape Split begins). I identified with Dora and thought she was a strong and likable character. The book takes a strong stance on the promotion of midwifery, which is fairly unknown to most these days. The traditional knowledge involved in being a midwife was interesting, but I felt it sometimes took up a bit too much of the book. Will you like it? : Unfortunately, I'll say it again - this is primarily a women's book and is good for book clubs. The midwife stuff is TMI at times, but otherwise I really liked the story and I think most people would as well. But don't take my word for it: the usual blurbs and reader reviews from Amazon, the book's official website, one from Blogher.org, another from LiteraryMama.com, one from Toronto's Now Magazine, and finally one from the Book-a-rama blog. The Basics: The Custodian of Paradise, Wayne Johnston, 2006, 528 pages, hardcover. How I found it: This book got a fair amount of press when it was released last year and since I have enjoyed some of Johnston's other work, I put my name down on the waiting list at the library. What's it about? : This is the companion book to Johnston's The Colony of Unrequited Dreams, a fictionalized biography of Joey Smallwood, Newfoundland's first premier. In that book Joey Smallwood's sometime friend and some time nemesis, Fielding, plays a fairly important role at times. This book is Fielding's story. Sheilagh Fielding is a 6'3" misfit, unsure of her heritage, and unable to live according to society's conventions. She has an acid wit and is known about St. John's for it, along with her stature and eccentricity. The book tells the story of her life and focuses on her relationship with a mysterious never seen guardian who will only identify himself as "Your Provider". Did I like it? : I expected to really like it, but somehow was a bit disappointed. I think perhaps it was because of the length of the book... after awhile it began to drag. I enjoyed Fielding's early years, but as she became more and more obsessed with her provider, I began to lose interest. I found the storyline surrounding her provider to be a little contrived and really beyond belief. I also thought that for a book told in the first person, we didn't really learn that much about Fielding... I didn't feel as if I knew her very well after reading it. She is a very difficult character to relate to, perhaps because she is such a charicature in a lot of ways. Will you like it? : This is an interesting read, as is usual for a Wayne Johnston book. It is also a unique look at Newfoundland when it was still a colony. However, this wasn't nearly as good as Colony of Unrequited Dreams, or even the Navigator of New York. It has been awhile since I read Colony and I think perhaps this book would be better if read directly after reading Colony. But don't take my word for it: The usual collection of blurbs and reader reviews from amazon, a review from topix.net, one from the Tyee, one from the Chicago Sun-Times, one from the Perceptive Travel Blog, and the author's website. How I found it: My dad recommended this one, even going so far as to send me a special email urging me to read it. What's it about? : This is the true story of a boat of Australian fisheries enforcement officers trying to stop illegal poaching of the Patagonian toothfish in their territorial waters. The Patagonian toothfish, more commonly served in North American under the name Chilean Sea Bass is a fish of recent popularity, but is fast becoming as overfished and endangered as cod. The Uruguaian poachers don't care though - they just want to make money. 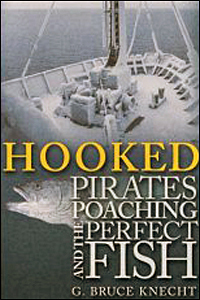 The book follows the course of a multi-day high seas chase through dangers Antarctic waters as the fisheries officers attempt to arrest the poachers. Did I like it? : While this book didn't really sound like something I would typically be interested in, I couldn't put it down. It is well written, a great story, and has a good environmental message. It actually made me want to take a Law of the Sea course next year, although I can't ever imagine practicing Maritime Law. It is a real life action adventure story, as well as a bit of really interesting background information about how the fish we eat gets to our plates. Will you like it? : If you like good non-fiction, this is a must read. It's a great story and it will teach you a bit about the state of our oceans while you are at it. This book is far from dry, despite its subject. But don't take my word for it: the usual collection of reviews from Amazon, a brief review from the Sacramento News and Review, one from Scienceagogo.com (scroll down), an article about the book from the environmentalist website Grist (which I love), and one from the BC-based Tyee (which I actually read every day - I guess I missed this article). How I found it: Greg bought this book at a local used bookstore and has never read it. I was out of books so I picked it up. What's it about? : The protagonist, Henry lives in the Florida Keys and charters his boat to everyone from big game fishermen, to rum runners and human traffickers in pre-Castro Cuba. He is a family man and is just trying to keep his family from hunger during the Depression. Due to the company he keeps and the lawless nature of the Florida Keys, plenty of shenanigans ensue and Henry goes quickly from "having" to "having not". Did I like it? : I'm not a huge Hemingway fan since he writes very masculine and macho stories. His portrayal of women is either non-existent or very misogynist. In this book he also comes across as racist. This book had some action-adventure type exciting bits, but besides that, I didn't find it that enjoyable. Henry is supposed to come off as a desperate character who will do almost anything to remain a sailor and provide for his family, but to me he seemed selfish and prone to taking unnecessary risks. Will you like it? : If you are Hemingway fan, I suppose this is required reading. But if you haven't read any of his work I suggest you start with A Farewell to Arms or The Sun Also Rises. This is definitely a "man's book" and not one I would recommend. But don't take my word for it: The usual product info from Amazon, a collection of reader reviews, the imdb page for the 1944 film of the same name starring Bogart which is only loosely based on the book, and the wikipedia entry are all I can find. How I found it: After I read Midnight at the Dragon Cafe, I decided to see what else Fong Bates had written. What's it about? : A collection of short stories about Chinese immigrant families in small Ontario towns. Each story invovles a set of sometime interrelated characters and family members dealing with a crisis or momentous occasion. One of the main themes is being the only Canadian born in a group of more traditional Chinese. Did I like it? : The stories in this collection are good but not great. If you have read Midnight at the Dragon Cafe, many of the themes and even settings will be familiar. This made me feel that I had already read some of these stories; it made me feel that Fong Bates was rehashing the same old same old. Overall though, the stories were pleasant to read and fairly well crafted. Will you like it? : This isn't a book I would advise anyone to rush out to pick up. It is pleasant enough, but there isn't really any particular reason to read it. If you are really into Chinese Immigrant stories, I suggest Wayson Choy and Denise Chong before this book. But don't take my word for it: The usual from Amazon, a review from someone at SFU, and one from Desijournal.com are all that is available. The Basics: A Short History of Tractors in Ukrainian, Marina Lewycka, 2005, 294 pages, paper back, longlisted for the Man Booker Prize in 2005. How I Found it: Last time I was at Chapters I saw this book and nearly bought it... this time I did buy it. This is a case of judging a book by its cover. What's it about? : A Ukrainian immigrant family in a small town in the UK deal with their father's impending remarriage to a women from the "motherland". Sisters Vera and Nadia have been feuding since their mother's death, but they have to band together to save their father. This is a story of a family rediscovering their love for each other, and it's often humorous. The eccentric patriarch, a former engineer, is writing a book, A Short History of Tractors in Ukrainian, that is the vehicle for connecting their old lives in the Ukraine with their new lives in England. Did I like it? : I really like this book. It was cutely funny, but also sad at times. I read it quite fast since the book is written in an effortless way. My only quibble with the book would be that some of the characters (the ones we aren't supposed to like) were very one dimensional and it wasn't clear what their motivation was. But I suppose that is the beauty of the story. Will you like it? : I think so. This is a cute little book and a great story about a family. Plus, it is about the immigrant experience and ties the old world to the new, which is always good. The characters are quite funny at times, and the plot unfolds well. Overall, a good fast read with lots of heart, if a bit pulpy at times. But don't take my word for it: The usual industry reviews from Amazon, a couple of glowing reader reviews, one from the London Times, a not so glowing review from the Guardian, one from the San Fransisco Chronicle, and a fairly negative review from Alan in Belfast. How I found it: Greg got this book for Christmas and since I am a fan of Holmes on Homes as well, I thought I'd read the book to educate myself. What's it about? : This is Mike Holmes' coffee table book style explanation of what he does on his show to "Make it Right". The book explains how to go about doing a home renovation starting from how to hire a contractor, to how to do each part of the job, to what materials and techniques to choose. There are lots of pictures - mostly stills from the TV show. Did I like it? : This book should be considered an accompaniment to the TV show. I liked reading it because it explained in a bit more detail why they do some of the things they do to fix people's houses on the show, and why they use the products they do. I also really liked that Mike seems to have an environmentalist bent, which doesn't always come through on the show. I am unhappily a long way off from owning a home, but I can got lots of ideas about energy efficient things I can do in my home, and environmentally products I can buy. Will you like it? : Unless you are a fan of the show, or about to embark on a home reno, I don't know that you would find this book that interesting. It is good as a companion to the show, but otherwise there isn't really a lot of reasons to read it. It's not really in depth enough to be a reference book, although the sections on how to find and deal with a contractor are good. But don't take my word for it: There are a handful of industry and reader reviews on Amazon.ca, and the official Holmes on Homes website. The Basics: The Time Traveler's Wife, Audrey Niffenegger, 2003, 518 pages, paperback. 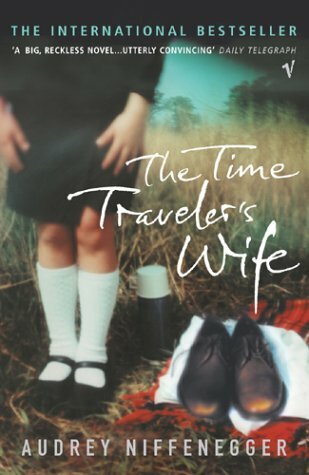 How I found it: My youngest sister called me on her cellphone a few days before Christmas to ask if I had read The Time Traveler's Wife. When I said I hadn't I assumed I would be receiving it as a her Christmas gift to me in a few days. Instead, she got me the awesome Middlesex. When I was using a Christmas gift card (from my mom) at Chapters I saw this book and since my sister had effectively recommended it, I picked it up. What's it about? : Henry is a time traveler. He has a disorder that causes him to travel to other times when he gets stressed out, scared, or has another trigger for his problem. It is sort of like epilepsy, only with time travelling instead of seizures. Clare is his wife, except that she meets him when she is 6 years old since he time travels into her childhood to meet her. She knows him her whole life. The books is about the unfolding of their life together in their strange mixed up chronology. It is a love story and it is also about the dangers of Henry's disorder and his attempts to cure it. Did I like it? : I LOVED this book. I can't believe this is Niffenegger's first novel. The writing is not exceptional, but it is very polished with well developed characters and a seamless plot. I found the book a bit confusing at first while I wrapped my head around the whole time-travelling thing, but I soon got into it. I couldn't put this book down - I wanted to see how it ended, but at the same time I didn't want it to end. It was incredibly romantic, and therefore, incredibly sad at times. I have to say I was hesitant to read this book since it is so popular, but this time, the public actually made a good choice. Will you like it? : If you have a romantic bone in your body you should read this book. It's a great story, even without the romantic aspect. And don't be put off by the time-travelling part - this book is about as far away from science fiction as you can get. It's a neat idea for a book that is well executed here. But don't take my word for it: A collection of reviews from Amazon.ca, this is a popular book so here is a collection of 109 reader reviews, a review from ReviewsofBooks.com, one from the Guardian, another from January Magazine, one from curledup.com, one from the Medical Humanities blog, one from a guy named Steve's blog (guys like "good old sentimental weepies" too), and the imdb page for the movie, coming out in 2008 and potentially starring Rachel McAdams.